I have been developing a tiny tool, RedPen. The tool is for proofreading input texts written in Markdown or LaTeX formats, and written in Java. As this tool are released, the jar files are uploaded into the Nexus repository. For uploading, we used the Maven release plugin. Although the settings of Maven release plugin (“pom.xml”, electronic signatures, etc.) is bothered, the tool itself is convenient. We can upload the artifacts to the Nexus repository just running the mvn release command at a release timing. However, I have recently feel that the release process with the plugin is troublesome. This article introduces an automatic release process covering adding version numbers and upload artifacts to the Nexus repository with Walter, a tiny deployment pipeline and Git Hooks. But first, I would like to introduce the release process with the Maven release plugin. When we run the release plugin, we need to input misc information interactively. The following is the status for the preparation of a release plugin running mvn release:prepare. Then, we are requested to input the release version, though the release plugin suggests the release version guessed from the current snapshot version (1.7.5 in the above example). If the suggested version is not what we want, we input the version number manually. Next, the plugin requests a development version number, and the we input it manually if necessary. After that, the plugin commits the new version number to local git, and then the build is executed. When the build succeeds, the plugin notifies that it will push the version number change to the remote repository. As we see, the plugin requests the GitHub account name and password. In addition, even after mvn release:prepare succeeds, we still need to input interactively even for the next release command,release:perform. As we see the release plugin is quite tricky due to its interactive input operation. Recently I heard that we can use mvn deploy command for the release purpose and the command is simpler than Maven release plugin. We can apply mvn deploy Jenkins server for the release automation, and off course we can use external CI services such as Wercker or Traivs for this purpose. But just for the release process of a tiny project such as RedPen, both solutions are a bit costly. In addition, analyzing the log files in remote servers is bothered when the release process in such services does not work. Therefore, I apply Walter for the automation of release process. Walter automates the release process and the process is run locally. Please refer here for details of Walter. Below is the configuration file for the automation of the RedPen release process. command: git commit -m "Set version in pom.xml to $REDPEN_VERSION"
command: git tag -a redpen-$REDPEN_VERSION -m "RedPen release $REDPEN_VERSION"
command: git commit -m "Update versions in pom.xml for next release"
The first stage sets the version that was given from the environment variable. Next stage registers the changes to git. The artifacts are now ready to be uploaded on Nexus. Then the fourth stage (Delopy to Sonatype) uploads results to Sonatype with “mvn clean deploy”. After the deployment, Walter assigns the development version for the next release. The development version name in Java projects commonly has a “-SNAPSHOT” suffix. The stage, “Flush Next Release Version Number”, calculates the next version number, and then set the version with the “mvn versions:set” command. The release process is then completed just running the “walter -c release.yml” command (off course we need to close and release the stating repository by manual operation in Sonatype). The release processing is able to be completed with a single command. However, one problem still exists. RedPen has the ability to check its versions with a command and server. The version is set by overwriting one line of the RedPen.java file. Unfortunately I have an experience releasing RedPen without increasing the version number. For the problem, I applied Git Hook to solve this problem with Walter. When a specific git command is run, Git Hook automatically runs an assigned script. I set Git Hook script to run the release command automatically with Walter only when the commit message is “Bump version…” at the time of git commit. Specifically I put the following Git Hook script file in ./git/hooks/post-commit. With this file, when the commit message shows “Bump version” the release processing will run (the commit message that changes the RedPen version is Bump version). This trick prevents accidental release without increasing version number. In the RedPen project, a sample server on Heroku is replaced to a the latest every time a commit is pushed to the remote repository. Although I am currently using Jenkins for the replacement of servers, I will try the replace of the process in Walter as the next step. Walter, a deployment pipeline was released almost exactly one year ago. Although it has been slow going since then, the development is still ongoing. This blog entry explains how Walter has been improved since its release. These improvements can be classified into several types. This post will explain each of them in the following section. Environment variables can now be used on Water pipelines. Environment variables are written in the pipeline settings file using $VAR. All environment variables at the execution of Walter commands are available. For example, the following command outputs the details of the environmental variable GOPATH. With the following settings, the safety can be improved by describing information that you do not want to register to a repository, such as the keys required for HipChat, as an environmental variable. Walter users add lists of stages to the pipeline blog and describes their processing. Normally, only commands (command) and stage names (name) are specified in Walter’s stages. For example, in the following stage added to the pipeline below, the name “show the files” and its command (ls -la) are specified. only_if property executes the stage only when the specified conditions are satisfied. In the following example, the command specified using “command” is executed only when the value of the environment variable, WERCKER is set to TRUE. directory specifies the directory where Walter executes the command. For example, the following Is stage displays a list of the /usr/local files. The newly-added cleanup pipeline defines the post process. Specifically, cleanup is executed after the process described in the pipeline has finished. The following pipeline block changes the input.data file to Apache Solr input format before registering the data. The cleanup pipeline operates after the pipeline has been finished. In the following example, the data created for Solr inputs is deleted. There have been requests to reuse stages already defined in Walter configurations. Mechanisms to import files that include stage definitions (stage definitions files) are now supported. An example of a stage definitions file is shown below. The stage definitions file describes the namespace and stages. The namespace was added so that names are not collision even when multiple namespace definitions files are called. The def blocks are added in the stages block, and the stage defined. In the following example, the whomai stage is defined. The stage definition file described above is saved using the name stages.yml. The require block imports the stage definitions file from the stage definitions file. The defined stage is called using call. The called stage is described using the namespace::stage name format. The results of previous stages in the pipeline can be acquired using three special variables (__OUT, __ERR, __RESULT). __OUT: Stores the result (“true” or “false”) output to standard outputs. __ERR: Stores the results output to the standard error outputs. __RESULT: Stores the command return value. The variables are used as maps. Assigning a stage name as the variable key acquires the stage results. For example, in the following example, the second stage uses the output results from the first stage. Specifically, the input markdown document (markdown.md) is checked during the first stage with an OSS proofreading tool RedPen, and then in the second stage, whether or not an error was output to the standard error outputs of the first stage is checked. If an error was not output during the second stage, a PDF is created. Ongoing development of Walter is scheduled for the future. In particular, this winter, Walter is scheduled to support server functions. We also want to enable the stage start conditions to be specifiable. Currently, when the previous stage finished, the next stage ends up starting immediately, but specifying the start conditions will enable settings such as wait until the necessary port is ready to be set. This article introduces an application of Walter, a deployment pipeline, to software tests. Specifically, how Walter is applied to the integration tests of my personal products, Serverspec and Specinfra are covered. Application of Walter to the integration tests of Serverspec and Specinfra are described. Combination of Walter and Wercker is nice. Especially parallel executions by Walter in Wercker is useful. As a dogfooding trial, I apply Walter to the Wercker CI for the integration tests of Serverspec and Specinfra. The following shows the wercker.yml file for integration testing Serverspec. The below shows the pipeline.yml called from wercker.yml. only_if: test "$WERCKER" = "true"
When the processes are different between local and Wercker, we can use the only_if feature which allows us to change the behaviors by the environments. Of course, we can execute the tests with Wercker v2 locally. Unfortunately Wercker v2 is a bit hassle, since it needs Docker nevertheless the integration tests of Serverspec and Specinfra do not need Docker.. Therefore I feel Walter is handy since Walter does not need any VM systems. The tests are run in each VM which is created for the OS on DigitalOcean. The tests are executed in parallel with the following Walter configuration. only_if: test "$WERCKER_GIT_REPOSITORY" != "serverspec"
and then executes the provisioning by Itamae and run tests with Serverspec. When the test run in sequence, the tests are not finished within the limit (25 minitutes). By contrast, Walter with the above settings finish the all tests within the limit. We can see the Wercker log here. The following is the image of the log. As wee see, it is a bit difficult to understand the results. Specifically when some tests are failed in a environment (OS), understanding that the failed tests were run in which OS is not intuitive. I overcome the problem by the Slack notification feature provided by Walter. Walter provide messenger notification. The results of the stages are sent to a Slack or HipChat channel. In the above case, we can see the tests of CoreOS are failed. 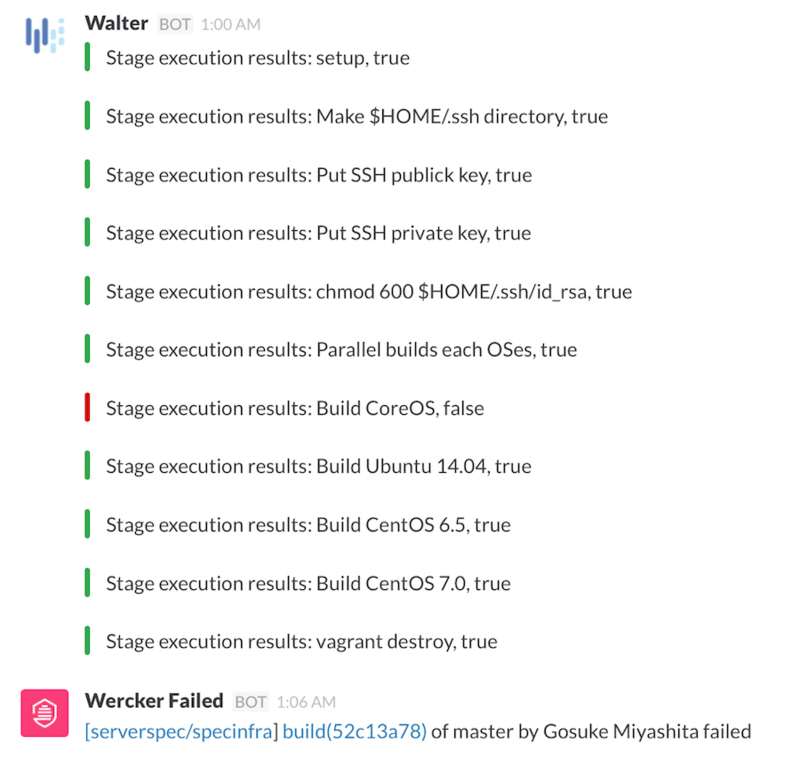 Clicking the bottom link and move the the build page, we can see the failure is from CoreOS tests. Currently I am satisfied with the combination of Wercker and Walter. As a next step I will use Walter with Jenkins or other CI systems and add the features to Walter if needed. 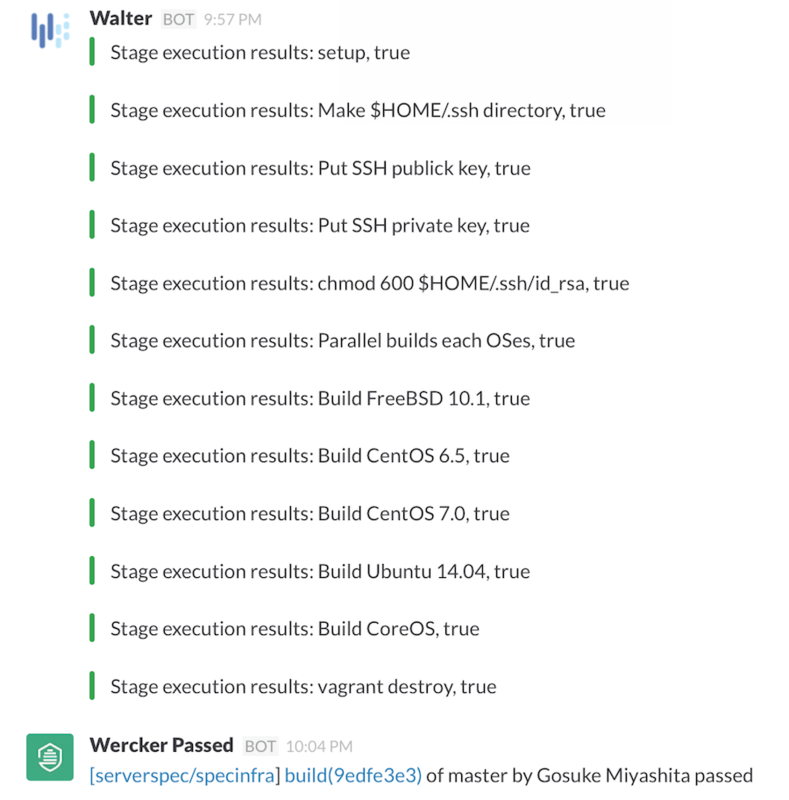 In addition, I have a plan to provide the Walter server with which users can build CI system without Jenkins or other CI services.